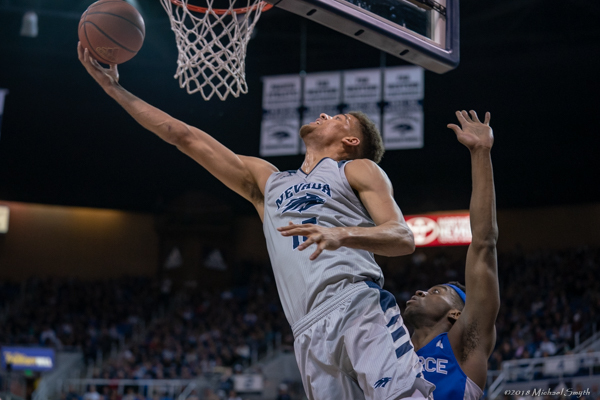 Trey Porter’s 11 points and six rebounds helped 10th-ranked Nevada defeat Air Force 67-52 in Reno in a men’s basketball game on Saturday night at Lawlor Events Center. 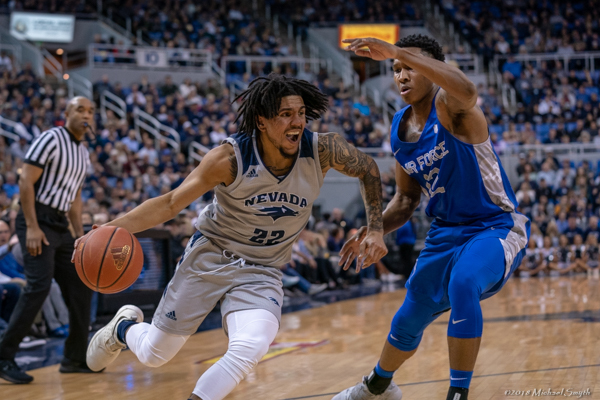 After a historically poor first-half performance, Nevada cleaned up with another signature second-half comeback, improving to 18-1 overall and 5-1 in the Mountain West Conference. Nevada trailed 24-20 at halftime with its lowest scoring first-half in coach Eric Musselman’s four seasons. 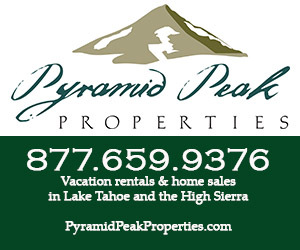 His team’s next lowest scoring output was 21 points against Coastal Carolina in his coaching debut with Nevada. 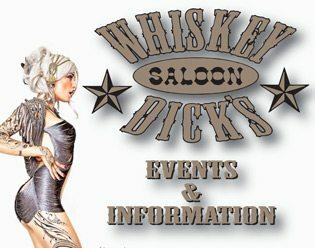 The Wolf Pack shot 1 of 13 from 3-point range and totaled eight turnovers, but outscored Air Force 43-22 in the second half thanks suffocating defense and timely baskets. Center Trey Porter scored 11 points and added six rebounds. He was a catalyst offensively and his energy was felt all game, including an altercation with Falcons guard Sid Tomes in the second half. Both players received technical fouls. Another dominant defensive performance led the the Pack to victory. 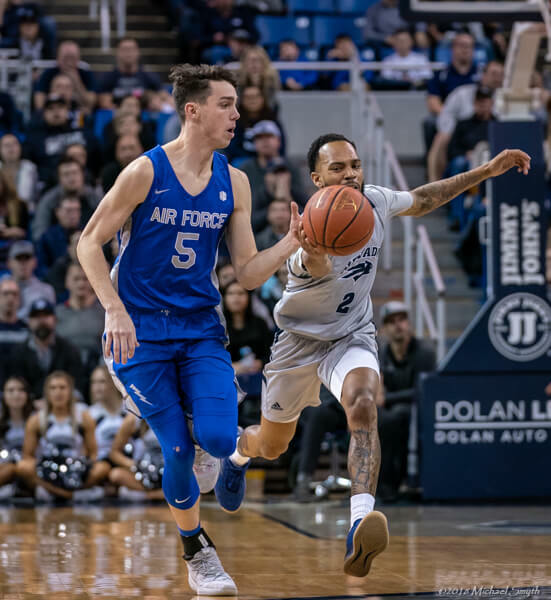 Air Force was held to 35 percent shooting from the field and 28 percent from behind the 3-point arc. 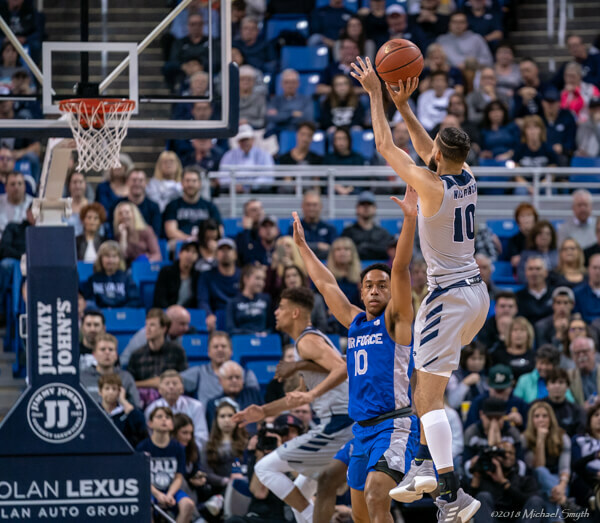 Lavelle Scottie (15 points) was the only player to score in double-figures and Nevada forced 21 turnovers, which translated to 14 points in transition. 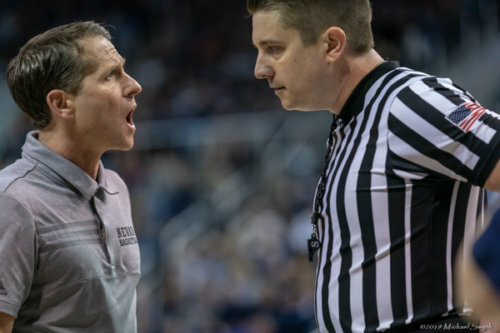 Nevada coach Eric Musselman makes a point from the sidelines. Nevada shot 42 percent from the field and 19 percent from 3-point distance, going 5 of 27. Its reliance on the 3-ball against zone defenses has kept opponents in the game for a majority of the season. Jordan Caroline scored a game-high 19 points and eight rebounds. He has scored in double-figures in every game this season and Saturday he moved to eighth place on Nevada’s all-time scoring list. Senior guard Caleb Martin, who finished with 10 points on 4-15 shooting, has been battling flu-like symptoms for the last couple of days and his status for the game was up in the air, according to Musselman. Porter’s play down the stretch kept freshman center Jordan Brown on the bench for much of the game. Brown totaled a season-low seven minutes, all of which came in the first half. An experienced squad, the Wolf Pack has started all seniors in every game this season. The Pack featured the starting five of Caroline, Porter, Corey Henson and the Martin twins for the fourth-straight game. The unit was crucial to retake the lead in the second half, closing out on shooters and pounding the ball inside on the other end. Another slow start offensively had the Pack down 15-10 in the early going. Air Force nailed three 3-pointers in the first seven minutes while the Pack started one of nine from deep. Nevada responded with a quick 3-0 run fueled by easy layups in transition. Caroline’s and-1 layup brought the deficit to three points, but Air Force closed the half out on a strong note to keep its halftime lead. Nevada’s lead hit double-digits with under eight minutes remaining. Henson sank his first 3-point of the contest and the Pack closed the game out on a 11-6 run over the final three minutes. 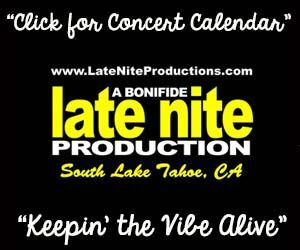 The Wolf Pack faces the Colorado State Rams on Wednesday at Lawlor Events Center. Led by junior forward Nico Carvacho, Colorado State is 7-11 overall and 2-3 in conference play. Notes: Caleb Martin has scored 65 percent of his points in the second half (222-344). … Jordan Caroline is averaging 18.3 points and 9.7 rebounds per game. He has 11 double-doubles this season. 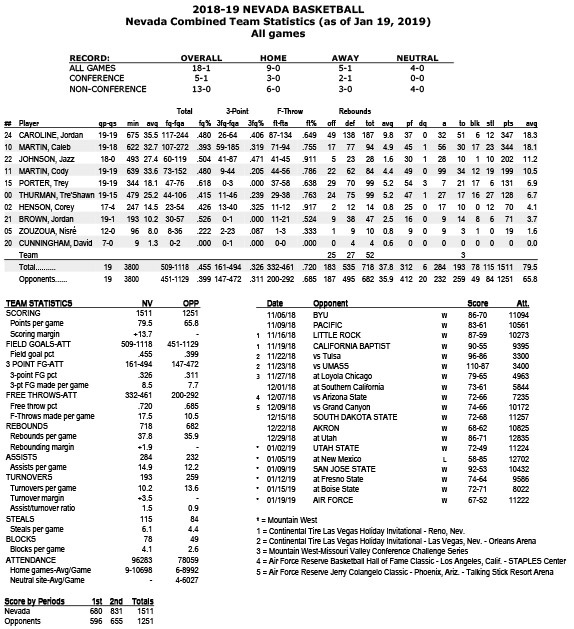 … Cody Martin leads the Mountain West in assists per game (5.1) and assist to turnover ratio (3.2). 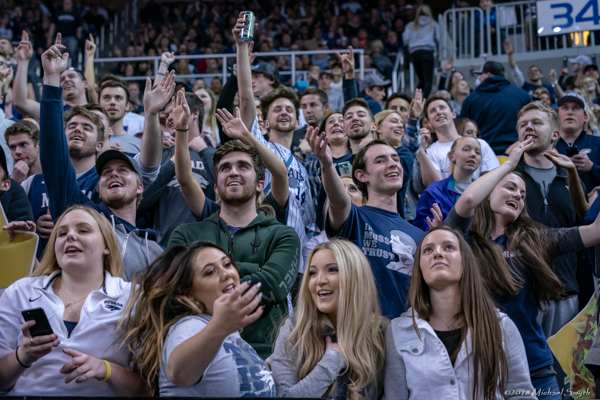 … Nevada is 42-2 in its last 44 home games… The paid attendance of 11,222 was 11th-highest in school history. Related story: Shooting guard from Atlantic 10 Conference transfers to Nevada. 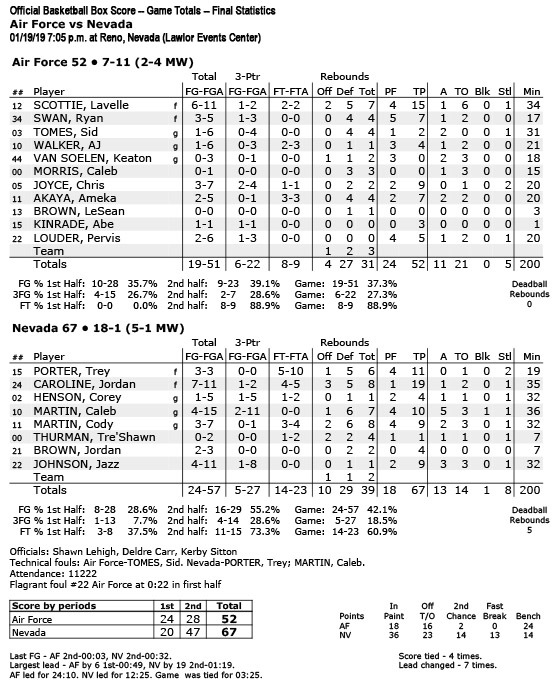 Jazz Johnson scored nine points in the Wolf Pack’s win. Corey Henson steals the ball from Chris Joyce. Henson is third in the conference in steals. Caleb Martin battled through a case of the flu and lets a 3-pointer fly.